Any time you can combine a little art, a lot of color, and endless pattern creations into an inexpensive toy for kids and adults you better believe I’ll be featuring it. Kaleidograph is a simple system of diecut cards that can be layered, relayered, flipped, and rotated into millions (they say 350 million!) of different kaleidoscopic patterns. I’m finding great color combos and new shapes with every switch I make. It’s a great visual puzzle – and truly open-ended for kids. At $12.99, both versions – the Kaleidograph Flora (rounded forms) and the Kaleidograph Crystal (angular forms) would be great gifts for the designers in your life, whether they be 3 years old or of a slightly older vintage. Try it out online with their interactive Kaleidograph website, but be warned: it’s even more addictive in person (and the colors are better too). 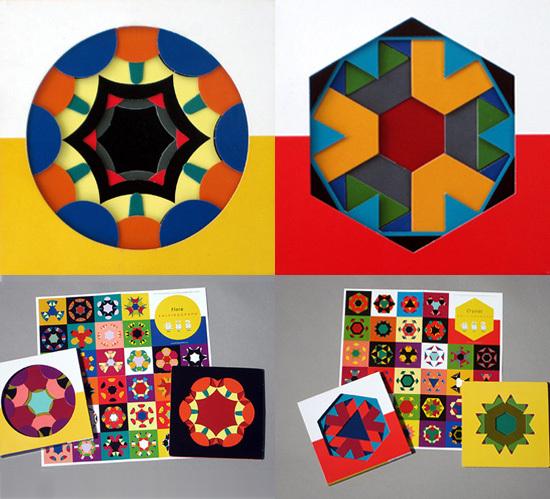 Thanks Kaleidograph, for providing me with the samples – I’ll be fiddling with them for days now! Next post: are we there yeti?